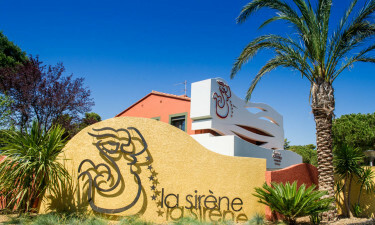 La Sirene offers camping luxury in the beautiful Languedoc region, near the city of Perpignan. The campsite, in Argelès-sur-Mer, is a short walk or cycle from the beach, and has its own water park complex. Book your camping holiday with Lux-Camp and discover a tropical paradise in the Pyrenees. 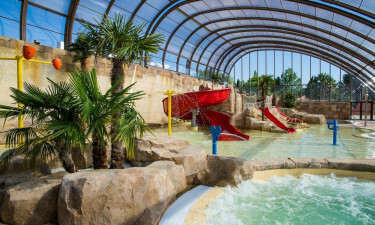 The water park at La Sirene is a huge complex of pools, with something for everyone. There are heated outdoor pools, children's play areas, giant slides, and a Jacuzzi, to make your day as fun or as relaxing as you wish. Out of the water, there are sports and activities for all the family, evening entertainment and, during the high season, a disco for teenagers. It's easy to spend your whole day at the pool. Why choose La Sirene for your next holiday? Below you will be able to read more about the reasons why you should choose to go on holiday to La Sirene. Argelès-sur-Mer is close to the border with Spain. Pop over for some shopping, or sightseeing along the coast, or make a day trip to Barcelona. The tiny country of Andorra is also within reach, as are the spectacular Pyrenees mountains. There are national parks on both sides of the border, offering scenic views whether you prefer coast, countryside, or mountains. La Sirene offers a range of luxury mobile homes in different sizes and styles, to suit couples, families, and groups of friends. Whether you prefer to be close to all amenities or off the beaten track, a mobile home offers luxury camping at a highly competitive price. There's no shortage of dining options at La Sirene. Take your time over an a la carte meal in the restaurant, or enjoy an evening show with your dinner. 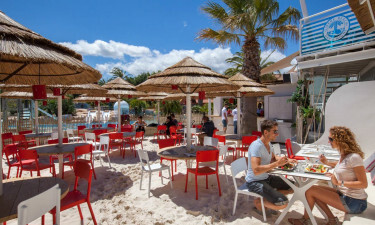 The pizzeria provides a more informal setting, or, if you prefer to eat al fresco, it's easy to grab a takeaway from the snack bar, or a refreshing treat from the ice cream stand. The fun doesn't stop after dark, as the beach club serves drinks in a party atmosphere. Pick up newly baked bread and fresh fruit for breakfast without leaving the site. With local produce, snacks, soft drinks, and local wines, the camp supermarket everything you need to prepare a great meal. For a convenient, fun holiday meal, why not have a barbecue at your pitch? There's a newsagent for your daily paper, a clothing shop for all your beachwear needs, and an outlet for beach toys, in case you've forgotten the buckets and spades.